EuroGames in Helsinki, 29th of June - 2nd of July 2016, is the next huge LGBTIQ event in Europe combining sports, culture and human rights. Preparations for most of the sports are well under way: venues are reserved and contracts with co-operative parties are made. The venues are all regularly used sport halls or fields and our partners are experienced sport competition organisers, and therefore you should be able to look forward to quality competitions! More details are given on the sport specific web pages at www.eurogameshelsinki.org/the-sports. Note, that a few sports have recently been added to the program: 5,000m running on track, 10,000m cross country running and discus. Squash and petanque are under consideration, so please, follow our Facebook page, http://www.facebook.com/EuroGamesHelsinki, for the latest news and discussions. Registration fee for all the competitive sports is for EGLSF (European Gay and Lesbian Sports Federation) members 85 €. Discount code for the fee is EGLSF2016L. For non-EGLSF members the fee is 110 €. A 5€ payment method / credit card charge fee will be added to all registration fees. Registration for swimming, tennis and track & field ends May 31. For badminton, basketball, bowling, bridge, cross-country running, dance, golf, floorball, football, squash and volleyball we keep the registration open till June 14. Registration fee will be 145 € starting from June 1, so in order to use your EGLSF member discount, register by May 31! Visitors Passes are available till June 14 and Closing Party tickets till June 24. EuroGames Village, located just a few steps away from the Railway Station, is open every day during the games from 12.00 to 24.00 (Wed - Fri) / 22.00 (Sat). There will be food, drinks, fashion and entertainment throughout the entire time! The village is open to all public, so we are expecting it to be a buzzing meeting point for you, Pride participants and other citizens. The party starts with a flag parade of the participants and continues with ceremonial speeches followed by top class entertainers: music by Finnish Eurovision stars: Sandhja, Softengine, Krista Siegfrids & Mikael Saari performing with dancers, drags and men in leather.Join the Facebook event for latest info. In celebration of this year’s EuroGames being hosted in Finland, Finlayson, one of the main sponsor of the event, designed a special print featuring Tom of Finland’s iconic men to help celebrate the games. The print is featured on a new Shopping Bag that we will be selling exclusively at the games. So if you want to score one of these unique bags, be sure to stop by this year’s EuroGames in Helsinki ! For those who like a more relaxed atmosphere, we recommend trying out the sauna area that will be placed in the EuroGames Restaurant Tent. You can follow the program on the both stages while floating with your fellow competitors in a hot tub. Several pro-wrestling matches during the day. Come and see when Jessica Love, the only transgender show wrestler in the world competes with the Finnish wrestling pioneer Starbuck. The final matches are held at 19:00. Registration for most sports is open only till 31.5. EGLSF members get a 15 € discount with the code EGLSF2016L. Visitor’s pass guarantees admittance to all event venues - all the sports halls and "EuroGames participants only" areas at the Opening & Closing Ceremonies. Most importantly, the pass includes a 4-day public transport ticket and a ticket to the EuroGames & Pride Closing Party. The price is 52,50 € per pass. Tickets for Saturday night’s huge party are now available through our registration and ticketing site. The EuroGames & Pride Closing Party takes place in a former cable factory close to city center and is organised by dtm, the largest gay bar & night club in Northern Europe. Ticket price is 26,5 €. Check out our Culture & Fun page for more details and for more side events. "The Land of the Midnight Fun" is a rainbow-colored musical about Finnish summer. On their way from Lapland to Helsinki an international group of travellers experience a joyful and unforgettable Midsummer full of magic and love. How does Finnish summer madness look through the eyes of foreigners? On this white night anything can happen! The first Finnish gay musical "The Land of the Midnight Fun" is a fun and crazy musical journey through Finland. On Midsummer Night a colorful group of passengers witness the true Finnish summer madness. In many ways! The project is a joint production of Helsinki Gay theatre HGT, Gay choir Out’n loud and HOT (the sports club hosting the EuroGames). The language of the musical is English and Finnish. Dates and time of the show: June 30th to July 2nd 2016 at 7 pm. Showtime: 3 hours including intermission. Place of the show: Savoy theater, Kasarminkatu 46, Helsinki. Tickets: 30,5 € with promotion code EG16. Buy your tickets now on Ticketmaster.fi. EuroGames is the brand of the biggest LGTBIQ sports event in Europe. Against that brand it is possible to gain sponsors, co-operative parties, and even more importantly, attention of the media and local citizens. All these put together make it possible to make the (sports) world a better place for everyone. At the individual level EuroGames is a great chance to practise sports and compete in an international atmosphere. That is not given for everyone who’s not part of a national team. And what makes EuroGames a special sports event, is the social aspect of them. Competitors are treated as friends and experiences of local grass root work are shared. These are the things why we want to, and have the energy to, continue the work against homo-, trans- and other phobias and to keep people moving. We in Helsinki, as the current holders of the brand, would like to see the brand prosper and new people to be able to experience the magic. Everything may not be or have been perfect in each event, but that is definitely not a good enough reason to throw away all the work that has been done to build the EuroGames brand and to give the amazing experiences to people from all over the globe. We should also remember that the work has not been done for gaining profit, but for the good of this community and mostly on volunteer basis. If you are with us in this movement, you may help us make the next EuroGames a grand event by sharing our promo material to your club members and friends. We have produced multilingual text and logo & image material to be published in social media, by email or on web pages. Here’s the link to the document. We appreciate your efforts. See you all in the summer! Bring your friends and family to EuroGames - Visitor’s passes are now available! As you probably know, not all the news posted to a Facebook page reach everyone who has liked the page. To be sure to get the latest news right away, join a Facebook group of your sport. You can find them by searching EuroGames 2016 <sport>. There you can also reach the sport managers and can let them know if you have any concerns or questions. We have as well added a Latest news section to our home page where you’ll also find the social media posts. 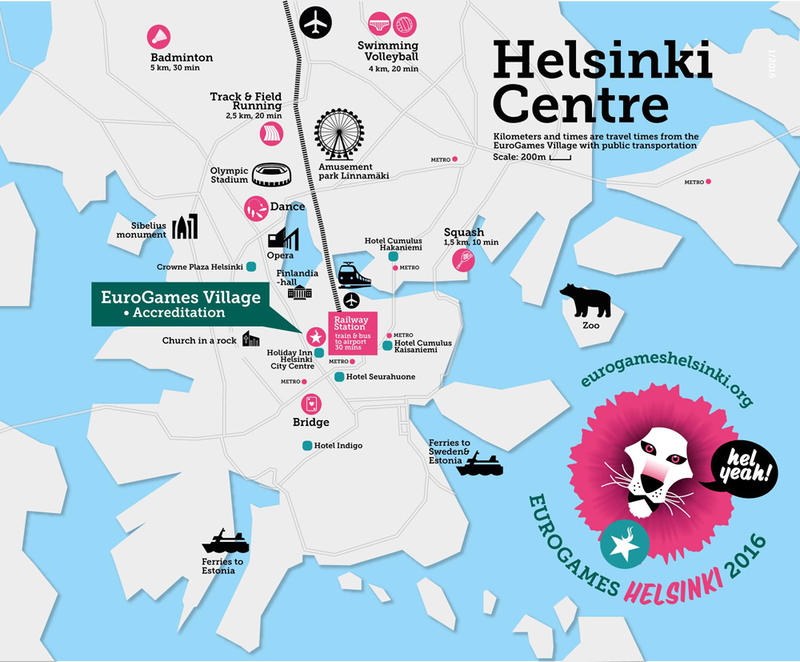 As you can see, all the roads lead to the EuroGames Village 29.6. - 2.7. The hotels are only 1 - 15 minutes walking distance from there, so it’ll be easy to maximise the fun while you are here. See the map for your sport and pick your hotel. If your sport is not in the city centre, it’s a good idea to stay close to the main railway station. You can as well find a journey planner on each sport’s web page so you can check the distance from the city centre to the sports venue. We strongly recommend booking a room now since there are other events in the city as well. Remember our hotel deal: 15 % discount of the current price. Explore hundreds of kilometres of shore line, hundreds of islands, 42 nature reserves and parks in Helsinki. Use your free public transport ticket or rent a bike or a canoe - Relaxing by or at the sea is the thing to do on a sunny day in Helsinki. Interior design and clothing boutiques combined with trendy restaurants and terraces are waiting for you in the Helsinki Design District. You may as well visit the Finnish Architecture and Design Museum while you’re in the neighbourhood. The largest collection of Touko Laaksonen’s art work ever will be presented at Kunsthalle Helsinki. It’s a must see! EuroGames Village will be the place to be during the event: Located here between the Central Railway Station, the Museum of Contemporary Art and the Music Centre, it will serve as a green resort in the heart of the city. 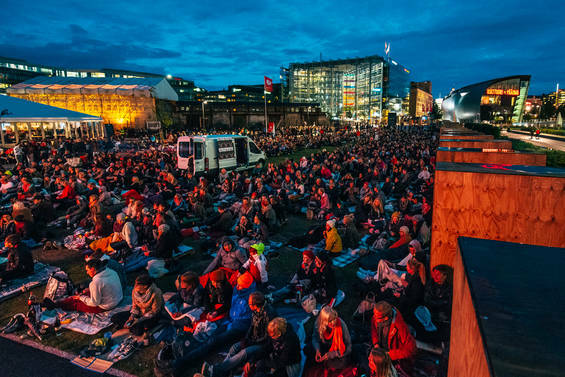 You’ll be able to enjoy the spirit of a Finnish Midsummer festival: a big stage, artists, bars, food trucks, sauna, a Nordic Midsummer pole and mölkky (a popular Finnish game). Village is open to all citizens, so EuroGames will certainly be seen and heard by everyone. EuroGames Helsinki has three more support athletes: Ari-Pekka Liukkonen, a swimmer who is on the way to Rio Olympics 2016 and was nominated as the Role model of the year at the Finnish Sport Gala in 2015 for being the first openly gay male top athlete. A professional football goalkeeper Tinja-Riikka Korpela, who is a long-time goalkeeper of the Finnish national team and currently plays for FC Bayern München. A Paralympic athlete for Finland, Toni Piispanen, who has played wheelchair rugby for fifteen years before switching to wheelchair racing in 2008. He is a world record holder in his classification in 100 m race. Registration fee for EGLSF members in 2016 is 85 € (+ 5 € payment method fee), whereas for others it’s 110 € + 5 €. Member discount is available with this code: EGLSF2016L. EuroGames Helsinki will be held under the patronage of President of the Republic of Finland, Mr. Sauli Niinistö. He has previously acted e.g. as the chairman of the Football Association of Finland and the organisation committee of the 2009 European Figure Skating Championships. The first support athlete of the games is an ice-hockey goalkeeper, Olympic medalist Noora Räty, who now plays in the men’s third highest league in Finland. Registration for squash (linkto: http://2016.eurogames.info/the-sports/squash/) is opened. We are expecting about 50 players to the tournament. The venue is centrally located and by the sea. Welcome! - And don’t forget to take advantage of the Early Bird prices that are valid till end of this year: registration fee 65€ + 5€ that includes a public transport ticket, opening & closing ceremonies and Helsinki Pride events! We have collected materials: banners, photos etc. to a web page (linkto: http://2016.eurogames.info/media/) for media and your clubs and associations. Help us promote the event and put a banner on your web page or share our photos and links in your communication channels. Thank you so much and have a Merry Christmas! Win a free registration to EuroGames Helsinki! One free registration will be drawn amongst people who register and pay the registration fee between 9.11.-15.11.2015 EET (Helsinki time zone). The winner will be announced 16.11. and will receive their fee as a refund. Remember to use this access code EGLSF2015EB when you register! Next summer in Helsinki is busy, so you will get a room with the best price, if you book now. See http://2016.eurogames.info/accommodation/ for booking details with our hotel partner which offers you 15 % off of the current price! You may check out the hotel and event venue locations on this map (https://www.google.com/maps/d/viewer?mid=zC2b6PCX6mzg.krVfJ_pg18tE) before you book. for more details and a link to the Outreach application system. Helsinki Region Transport (http://www.hsl.fi/en) granted free public transport tickets for all EuroGames participants and volunteers! Tickets are available during June 29 - July 2 and all sport venues, excluding Ypäjä golf course, are within the ticket zone. This summer HSL opened a commuter train connection from Helsinki airport to the city center, so travelling here is now made easy. Registration for squash will be opened soon! Follow our Facebook page, http://www.facebook.com/EuroGamesHelsinki, for latest news or come meet us in Schwerin at German-Rainbow-Open October 3-4.